Nov 20-21 2010, 9-4 p.m.
Enrollment total: 15. This workshop is appropriate for adults of all skill levels. In this two day workshop, students will make two different styles of flag book. The foundation of Hedi Kyle's deceptively small and simple "flag book" structure is an accordion folded spine. Flaps attached to both sides of each of the spine’s “mountain” folds allow the artist to fragment and layer a number of complementary or contrasting images and narratives. When the flag book spine is pulled fully open, the fragmented images on the flaps come together to create a large, panoramic image. This transformation is accompanied by a delightful flapping sound. The spine and covers provide opportunities for additional imagery. The class will discuss the effects of different spine and page dimensions, direction of motion, and which images will be most successful for different book styles. Students will learn a tidy, non-adhesive method of covering boards and use a jig to facilitate quicker, more precise assembly. Students will experiment with complementary and contrasting text and images. While this is not a computer class, digital printing and setting up Photoshop templates for pages, covers and spines will be demonstrated. Your space in the class is only guaranteed upon receipt of full payment, and is on a first-come, first-served basis. Make checks out to The Guild of Book Workers. We look forward to seeing you in this class! A few spaces still remaining - sign up today! during the Friends of Dard Hunter conference. The workshop will be located on the campus of the Arrowmont School of Arts and Crafts. Participants should leave with three simple but essential tools crafted during the workshop. For more information, please visit the Friends of Dard Hunter. Using simple tools such as a bone folder or a nipping press is essential for bookbinding. Learning to design and build these tools can have a great impact on the ease and quality of the work produced. The class will include an introduction to hand tools: saws, rasps, hand drills, chisels, and sandpaper; how to build a simple jig that will help us create the book binding tools; making a wooden “bone” folder custom shaped to your hand; building a simple nipping press; and building a punching cradle that will be functional and beautiful. I will bring my personal tools to share with the class. For those interested in purchasing hand tools for the class, or bringing their own tools, we will be using a crosscut carcass saw, a hand drill, various rasps, and assorted chisels (or carving knives). This workshop is intended as a connection between the worlds of bookbinding and woodworking, and to take some of the mystery out of woodworking, ultimately empowering the bookbinder with the necessary skills to create any tool they might need. 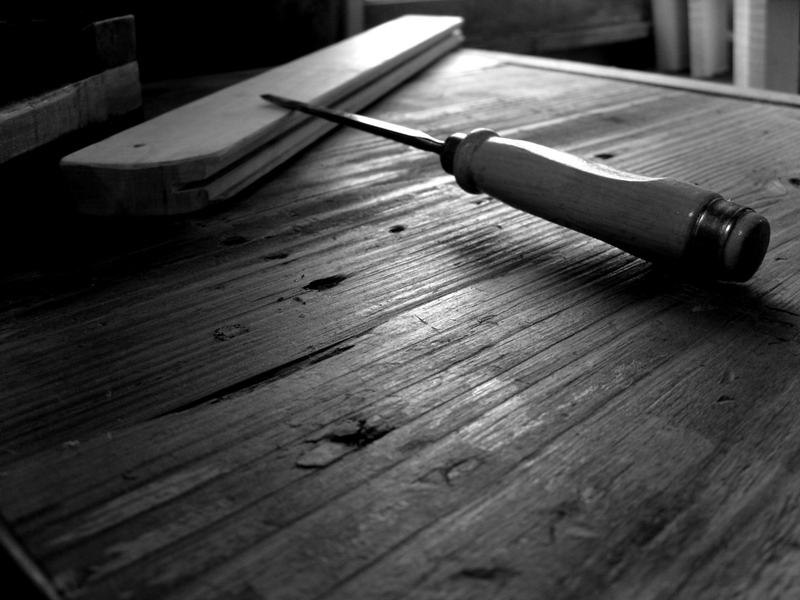 The building process will focus primarily on hand tool use, and no experience with woodworking is required. Randy J. Arnold is a luthier living in Northport, Alabama, and the third generation in his family to work with wood. In addition to musical instruments, Randy also creates handcrafted bookbinders’ tools. Randy works in the wood shop that his grandfather built in the early 1940’s, using many of his grandfather’s tools. to Decatur for the holiday weekend. The authors give readings, talks, and panel discussions. The event is free and open to the public. **PLEASE SEND WORK BY AUGUST 1, 2010. The check will help us cover the cost of the table at the festival. Any profits made from work you send will be mailed to you, along with any unsold work, after the event. We will handle your items with care, and do our best to make sure customers do as well. However, due to the nature of such festivals, consider inserting your work into clear bags, or other protective enclosures. Please use the inventory form sent to you by email. This will help us keep track of your sales. The “item code” should be your initials, followed by a number. For example, Jane Doe’s first item would be JD1, and its description might be “blue paste paper case binding.” Her next item would be JD2, etc. Questions? Email southeastguild@gmail.com. Want to join us at the festival? Great! Email us and we will let you know how to get there, and where we’ll be. Indie Craft Parade is seeking the most creative and talented artists in the southeast region to participate in the upcoming festival of handmade art. Please let any students, colleagues and members know about the first annual Indie Craft Parade: a juried art market catering to independent artisans. Applications will be accepted until midnight EST June 18, 2010. All crafters and artisans are encouraged to submit their work for consideration. For more details visit The Indie Craft Parade website at www.indiecraftparade.com or contact them at info@indiecraftparade.com. Announcing three PUBLIC BOOK ARTS WORKSHOPS in letterpress printing, papermaking and bookbinding in Tuscaloosa, Alabama. These workshops are open to the public, and require no previous experience. They are sponsored by the MFA in the Book Arts Program and the School of LIbrary and Information Sciences, University of Alabama and the Southeast Guild of Bookworkers. To register, email to jessica@papersouvenir.com, or call 973-886-1760. Registration ends three days prior to the start of the class. We will explore the theory that less is more by designing and letterpress printing editioned broadsides using a small amount of text and image. Participants will set a haiku poem that they have authored in metal type and print their words on the amazing and easy-to-use Vandercook printing press. We will also experiment with methods of adding color, image and texture such as sandograph, pressure printing and stenciling. Saturday, May 15, 9-6 p.m. & Sunday, May 16, 1-6 p.m. 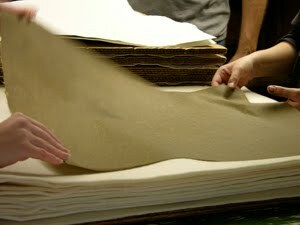 In this workshop, we will explore the wonder of handmade paper. 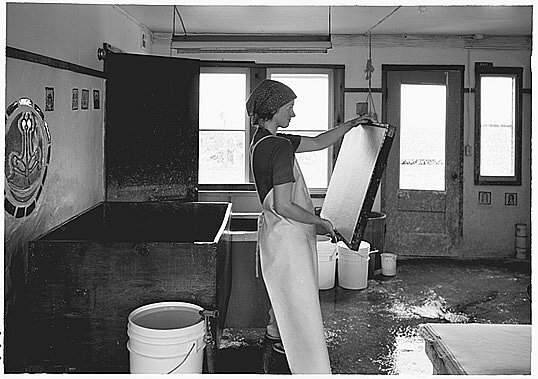 Students will be introduced to the components of a traditional papermaking in a professional papermill: from beating cotton bed sheets into paper pulp using a Hollander beater, to pulling sheets of paper from a vat using a traditional mould and deckle, to restraint drying. Friday and Saturday, May 28 & 29, 9-5 p.m. In this workshop, participants will learn three of the foundations of bookbinding: paste paper, the soft cover pamphlet structure and the accordion structure. Paste paper is a versatile and easy-to-learn method of making decorative paper using wheat starch and paint. Participants will use the decorative paste paper they make in the workshop for the covers of their accordion and pamphlet book structures. May 17 & 18, 6-9 p.m. 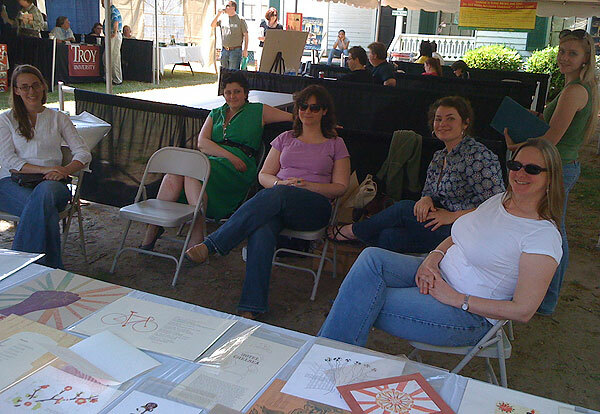 The April 17, 2010 Alabama Book Festival was a great opportunity to travel to Montgomery and see work by University of Alabama Book Arts students! The free public event is the state’s premier book festival—with more than 4,000 people from around the state converging in the capital to meet with and hear from their favorite authors and scholars. It is voting time for the Southeast Chapter of the Guild of Book Workers. Ballots are in the mail to you and should be completed and returned as soon as possible. PLEASE VOTE! Emily Tipps lives in Tuscaloosa, Alabama, where she teaches Book Arts and Creativity at the University of Alabama's New College. She holds an MA in Creative Writing from the University of Colorado at Boulder, and and MFA in Book Arts from the University of Alabama. Emily is the founder of High5 Press, which publishes innovative writing in limited-edition, handmade artist's books. She has served as the Southeast Chapter's treasurer since 2007. 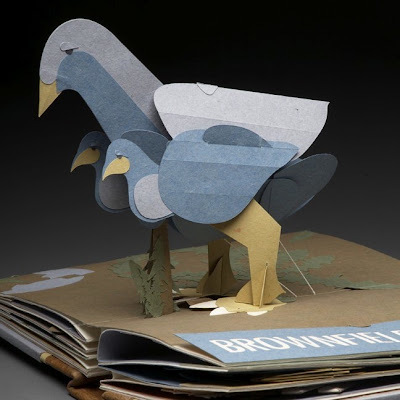 Ellen Knudson is a book artist and designer originally from North Carolina. She is currently a book arts curator and design/letterpress instructor at The University of Florida. She holds an MFA in Book Arts from The University of Alabama and produces handmade books under the imprint Crooked Letter Press. Her work is collected and exhibited both nationally and internationally. Kerri Harding is a bookmaker living in Tuscaloosa, Alabama. She is a student at The University of Alabama in the MFA in the Book Arts program. 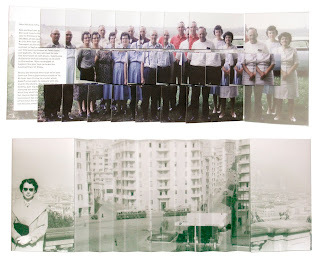 Her work includes artist's books, journals, and ephemera. She is in the planning stages of her thesis, which will be an exploration of various binding styles. Amy C. LeePard is a book artist and letterpress printer in Northport, Alabama. With a background in photography, Amy began, in 2007, working independently with book artists and printers to learn binding, case construction, papermaking, and letterpress printing. An Alabama native, Amy is the daughter of a graphic artist and a printer. Through her love of the book arts, she discovered her parent’s imprint of aesthetic and craftsmanship. Amy continues her exploration of the book arts through workshops, residencies, and conferences across the U.S. It's Spring! Celebrate and renew your creative spirit. At Asheville BookWorks our spring schedule is full of inspiring classes to put new life into your artistic endeavors. Along with our series of Pulp to Paper and Letterpress classes we are featuring some exciting new workshops. Also listed are those "back by popular demand" classes that everyone loves. Our instructors are all excellent artists with innumerable skills to share with their students. Looking for a class or workshop to learn a new printmaking technique or a different book structure? Need a creativity infusion? The American Print Alliance is launching a new page on The Atlanta Printmakers Studio website to help you find exactly what you want. APS's new list, free for everyone to use, concentrates on printmaking, papermaking and book arts classes, with other related media plus travel that includes art instruction. Whether you're looking for an evening etching class to ease you from Winter into Spring, or saving for that perfect Summer studio get-away, you can easily search our List of Classes & Workshops and then click to get complete information and registration forms. Go to http://www.printalliance.org/library/li_classes.html, or use the link on the APS homepage www.PrintAlliance.org (there's a direct link in the news item, or go to the Library section and select Classes & Workshops). Watch Your Mailboxes for SEGBW Chapter Election Ballots! It's voting time again! Members of the Southeast Chapter of the Guild of Bookworkers should be on the lookout for voting ballots to arrive in your mailboxes within the next few weeks. After voting, please return them ASAP! Thanks, everyone! The International Association of Master Penmen, Engrossers, and Teachers of Handwriting (IAMPETH) is an international, non-profit association dedicated to practicing and preserving the beautiful arts of calligraphy, engrossing, and fine penmanship. The IAMPETH Annual Convention offers a selection of half-day and full-day classes taught by expert instructors. Digital projectors are used so that you can see the instructor’s hand at work even from the back of the room. The convention is held in a hotel. The modest conference fee covers the instruction only. You make your own arrangements for lodging and meals. See the website for info on the $111 night rooms at the hotel (these rooms are limited; make your reservation with the hotel early). The $111 room rate is $99 plus approx taxes. Some classes may have a materials fee. There are classes on both pointed pen and broad-edged pen alphabets and on illumination. Students whose work is selected will be required to provide proof of enrollment. All entries must be original work completed by a book arts student (graduate or undergraduate) enrolled between Fall 2008 and Spring 2010. Scroll down the page to find the ARTBOUND icon and link to the entry form.